Today is Garden Blogger Bloom Day, that day when Carol at May Dreams Gardens asks each of us to share what is blooming in our garden! A very impressive cloudburst and other less torrential rain kept me out of the garden today so I was lucky once again to have some safety photos taken Saturday when I could have sworn it was just about spring. Above Tulbaghia fragrans is sending its sweet scent through the garden...it's the earliest blooming tulbaghia here. Crocus bloom here and there; I need to add many more. On the Wedding Arbor Clematis armandii is in bloom. I expected this plant to be much more vigorous but since it is alive and was my third attempt I guess I'll be happy. It shares the arbor with Rosa Flower Girl. Iris reticulata Symphony is beginning to bloom, considerably later than the blue reticulatas. An aloe blooms in a strawberry pot. Another photo of Lavandula pinnata buchii. Seems like I have one every other month but I take a lot of pictures of this since it blooms most of the year, unlike any other lavender in the garden. 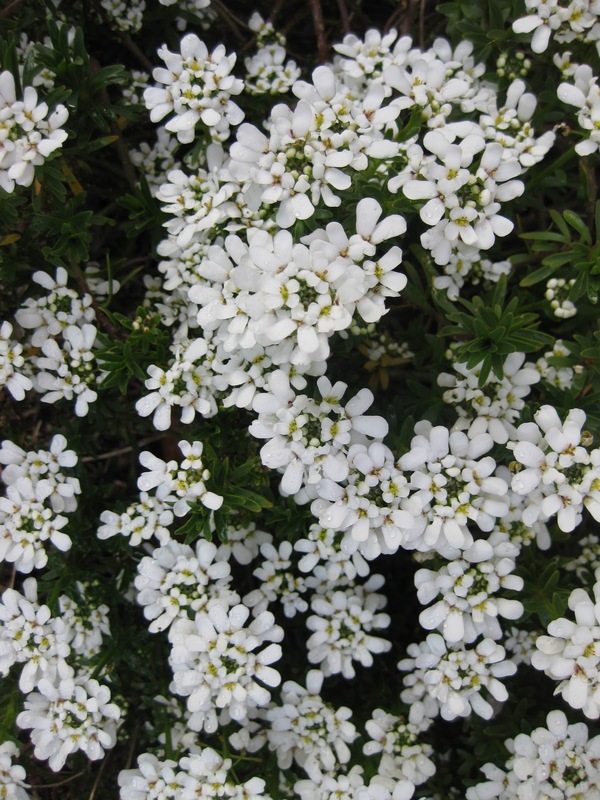 Iberis blooms in several places brightening up cloudy days. Clumps of leucojum aestivum bloom, these are some of the later blooming spots in the garden. Muscari in the back garden. Geranium citrosa is sending out a few blooms in preparation for spring! And indoors a begonia blooms while waiting for nicer weather so it can go back outside. Oooh, that yellow Iris reticulata is so pretty! Too bad it blooms so much later than the other reticulatas, it would set off the dark purples so well. It strikes me as odd that you have crocuses, muscari & lavender all blooming at the same time. That would never happen in my garden. Leslie - what a gorgeous spring garden. I can't wait til spring makes it to Massachusetts. Lots of nice blossoms in your garden. I especially like the idea of the succulents in the strawberry pot - might have to steal that idea. You you have so much blooming today...and so much of it is outside. I would take lots of pictures of lavendar if it bloomed as long as yours. I find it amazing that your viburnum looks so like the New England thrivers. I know, that is not a word but it fits. Great blooms Leslie. Enjoy. Looking forward to your photos Dee...your garden is always so lovely. I know, that was my hope Barb. But the muscari is blooming there now so there is a bit of contrast. Hi Pat...I just know spring will come to you once all that snow melts! RBell...feel free to steal the idea I'm sure I stole if from someone too! I'm lucky, Melissa, to have an early spring, being the weather wimp that I am. The trick for the lavender, Layanee and Gail, is that I had a lemon tree in a pot right next to it that I keep piazza lights on for really cold nights. The lemon has been moved so we'll see what happens next winter! Thanks Fairegarden...I think I need more of those iris too! Oh, my, what an abundant garden you grow! A feast for the eyes in the photos--thanks for sharing. I am envious of the lavender. I've tried twice, and have been unsuccessful. I just bought a third type--Serenity?--and hoping again. :) Thanks for popping by my site. Oh, my gosh, Leslie, the Clematis armandii is spectacular, especially compared to what they do here in my part of Texas. I killed one last year and the one I bought for my mother is only throwing off a few blooms. I'm determined to grow it, must find one somewhere! Hi Curtissann! I hope you find a good lavender! I've killed a few in my day as well. Cindy...this was my third try :) And it is getting coffee grounds every week or so...maybe that is helping. Aloe will bloom? Who knew? Mabey I should move on of ours outside this summer and see what happens. Love the lavender. Was planning on putting some Provence in pots this year, but maybe I should hedge my bets in the hopes of longer blooming. It's beautiful, Leslie. I get that puddling water thing a lot in mud season. I guess by now I am a little bit used to the idea that my houseplants are in the ground plants for you. I enjoy the Iberis. Looks like mine. So bright. Tulbaghia? another southafrican bulb i love but unable to get my hands on the bulb. You are growing some lovely flowers out there. Happy bloom day. Pretty purples, blues and white. My favorite combos. So many blooms with color and flare.